Think East Organic face scrub is a dry cleansing exfoliant that leaves your skin feeling clean, fresh and soft. Made only with three ingredients: Adzuki beans used by Japanese Imperial court beauties in their skin care regimens for centuries for its detoxifying and exfoliating properties; Oatmeal for its anti-inflammatory and soothing action and the best quality Japanese Green Tea (sen-cha) directly imported from Japan, for its remarkable anti-aging, anti-oxidant and anti-bacteral properties. Naturally scented with the heavenly delicate aroma of Japanese Green Tea. 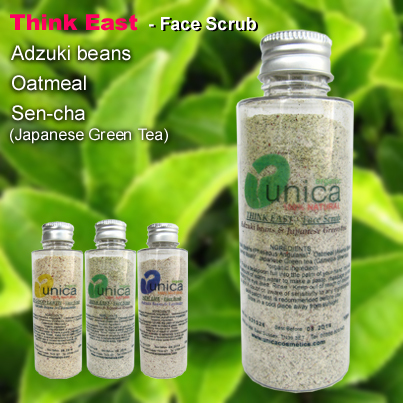 SKIN TYPES: Think East organic face scrub is suitable for all skin types especially for oily/combination & acne skin. 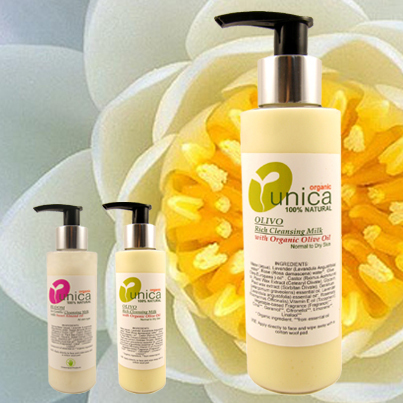 Also suitable for people with sensitive and eczema prone skin. USE: Pour about a teaspoon of product into your hand, mix with a small amount of warm water to make a paste, then massage on face avoiding the area around the eyes. Rinse. STORAGE: Store in a dry place, away from moisture. Keep out of reach of children. and you can't beat that." INGREDIENTS: Adzuki Beans (Phasedus Angularis), Oatmeal (Avena Sativa Kernel Meal),apanese Green tea (Camellia Sinensis). The facial scrub of Imperial court beauties, Adzuki has been used in Japanese skin care regimens for centuries. 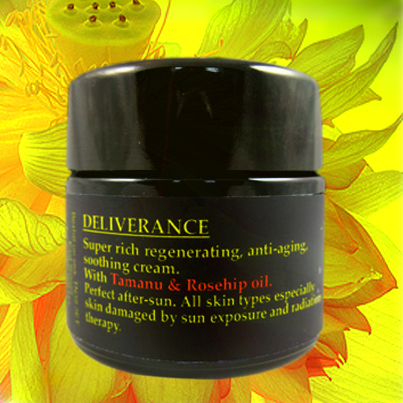 It gently exfoliates the skin without damaging the surface, giving a smoother and beautifully clear complexion. Adzuki is renown for its detoxifying properties. Green Tea has powerful anti-aging properties due to its high concentration of naturally occurring compounds called polyphenols and cathechins which are very potent antioxidant agents. These natural substances help trap and destroy free radicals, singlet oxygen, and peroxides responsible for the aging process. Green tea extract has recently been linked to significant cell rejuvination by top cellular research biologist Dr. Stephen Hsu of the Medical college of Georgia department of biology. Dr. Hsu determined that the Polyphenols compounds in Green Tea Extract, are powerful anti-oxidants that increase elasticity and ward off free radicals. The active ingredient catechin, has been found to outperform Vitamin C and beta-carotene ten times in scavenging the alkyl peroxyl radical. Furthermore catechins have far-reaching positive effects on the entire body, including anti-carcinogenic properties. In skincare preparations, Green Tea protects against the elements and helps restore the skin to a fresh and youthful appearance. Green Tea also extends the effectiveness of sun screen and has been shown to have strong anti-irritant, anti-inflammatory and anti-bacterial properties for cleaner and healthier looking skin, making it and ideal ingredient for the treatment of acne. The delicate scent of Green Tea helps restore a sense of calm, peace and overall well being.